West Brom have appointed former Liverpool manager Roy Hodgson as their new head coach. The 63-year-old, who parted company with the Reds in January after only six months in charge, succeeds Roberto di Matteo at the Hawthorns. Di Matteo was relieved of his duties and placed on gardening leave following Saturday's 3-0 loss at Manchester City. Caretaker head coach Michael Appleton will remain in temporary charge for the visit of West Ham on Saturday. "The club are now channelling all of their efforts into supporting Appleton, his assistants Keith Downing and Dean Kiely and the players as they prepare for tomorrow's vital game," said a statement. Hodgson will attend the match on a watching brief before meeting the West Brom hierarchy to discuss his plans and facing the media next week. The former Inter Milan, Blackburn and Switzerland boss has signed a contract until June 2012 and takes over a Baggies side who have lost 13 of their last 18 matches in all competitions. He was voted manager of the year by the League Managers' Association after guiding Fulham to the 2010 Europa League final and succeeded Rafael Benitez at Liverpool that summer. 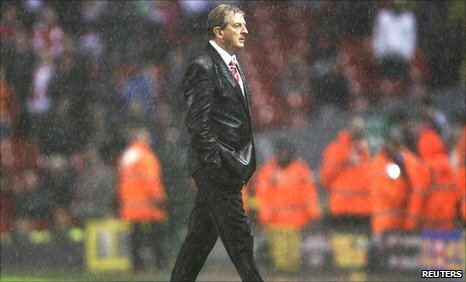 But the Englishman was dismissed on 8 January having won just seven of 20 Premier League games, with Reds legend Kenny Dalglish immediately installed as interim boss. Hodgson admits he never intended to return to management so quickly after being sacked by Liverpool last month. But he says he was so impressed with the West Brom "project" he decided to accept the offer. "It was not my intention to return to Barclays Premier League football this quickly," said Hodgson. "But I was so impressed by the way the chairman [Jeremy Peace] and the sporting and technical director [Dan Ashworth] sold the project to me that I was very happy to accept the offer. "I am delighted that a club of West Bromwich Albion's stature has given me the opportunity to help them in their quest to retain their Premier League status and to build for the future." Peace insisted Hodgson was always Albion's first choice. "At such a vital stage of the season, we felt it was important we identified and appointed the right man as quickly as possible," he said. "Roy emerged as the outstanding and unanimous choice of the football club board and we are delighted to have appointed our number-one target. "We believe his vast experience and knowledge of the game is exactly what we need for the challenge we face, both in the short and long term." Hodgson will not have to wait long to face his old club, with Liverpool due at the Hawthorns on 2 April. A West Brom spokesman confirmed to BBC Sport that Di Matteo remains on gardening leave and relieved of his duties until any further announcement. Chris Hughton was reportedly in pole position to replace the Italian, but it is understood there were potential hitches with the former Newcastle manager's support staff. "Hughton would probably want to bring in his two trusted assistants from his Newcastle days, Paul Barron, who is out of work, and Colin Calderwood, who is Hibernian manager, so compensation to Hibs might complicate matters," said BBC Radio 5 live's Midlands reporter Pat Murphy on Thursday. "And Hughton would have to agree to work alongside Dan Ashworth, the club's highly regarded sporting and technical director." Appleton - at 35 the youngest man ever to be put in charge of a Premier League team - was also interested in the job, telling BBC WM: "I've never hidden the fact that I wanted to be a manager since retiring [in 2004]. "I spoke to the chairman [Jeremy Peace] and Dan Ashworth and ultimately they explained what had happened and was I prepared to take the role. "It would've been foolish not to, at the end of the day. I felt it was responsible to look after the players, and at least they know me and they can trust me. "The first thing I did was ring Roberto, Eddie [Newton] and Ade [Mafe] just to offer my support. We had a good chat, they were very philosophical about the situation, and wished me all the best." The former Manchester United and Preston midfielder denied some newspaper stories suggesting there were disagreements brewing between Di Matteo and the players, leading to the Italian losing the dressing room. "No, no, I don't think that is the case at all, you hear stories on that all the time," Appleton insisted. "We were just going through a poor run, the facts speak for themselves." Appleton also responded to reports that some members of the squad found Di Matteo to be cold and aloof. "You're going to get that at any football club, people who are out of the XI are going to moan and say stuff about this, about the coaching staff, about managers - that happens all over the country and all over the world," he added.